If any company can convince shoppers to let someone else choose their produce and perishable goods, it’s Amazon.com. The internet retailer announced its proposed $13.7 billion acquisition of Whole Foods June 16. A Morning Consult poll conducted shortly after the announcement shows the advantage Amazon.com Inc. already has over its competitors in the industry: Among respondents who said they have used an online grocery delivery service, 42 percent said they have used AmazonFresh — nearly triple the figure for its closest competitors. In contrast, 16 percent of those respondents said they’ve used FreshDirect, which operates in five states and Washington, D.C. And the number falls to 12 percent for those who’ve reported using Peapod, a grocery delivery service operating in 24 markets across the country, or Instacart, a grocery delivery service that counts Whole Foods as a partner, along with CVS Pharmacy and Costco Wholesale Corp.
Ira Kalb, assistant professor of clinical marketing at the University of Southern California’s Marshall School of Business, said Amazon is privy to a “trust factor” because of its enduring customer service reputation. “We trust them because we know if it’s not right they’ll take care of it,” he said in a phone interview Monday. The internet giant also has the potential to innovate a grocery industry that has historically not taken the tech route, given Amazon’s pending patents on certain drone technologies, said Kalb, who is also president and CEO of Kalb & Associates, a consulting and training firm. Amazon has established the ability to “squeeze all the inefficiencies out of inventory delivery and payment systems,” opening the door for the company to be competitive in the grocery delivery space, he added. Recent Morning Consult polling shows Amazon is not only one of the country’s most admired employers but topped Morning Consult’s inaugural Most Loved Brands rankings. As of Monday, 83 percent of people say they have a positive view of Amazon, according to Morning Consult Brand Intelligence. Long-standing brand loyalty aside, any company promoting grocery delivery has to overcome consumers’ general reticence toward having anything other than canned food and household goods delivered to their doorstep. 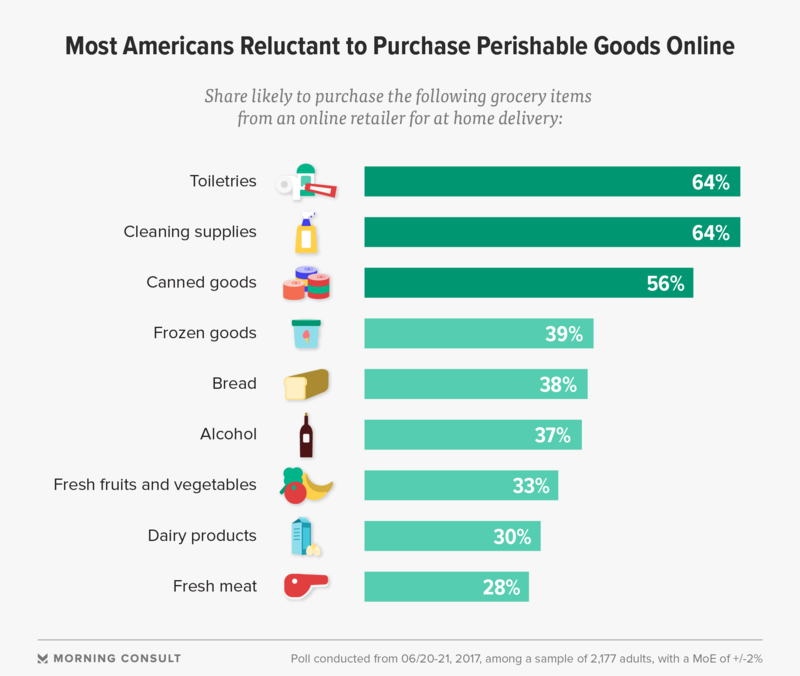 Fifty-six percent of people said they would be likely to have canned goods delivered via an online grocery service, and people also felt comfortable with delivery of toiletries and cleaning supplies. But anything else was a harder sell, as 68 percent of people said they were not likely to have meat shipped to them, along with 66 percent of people who said the same about dairy and 63 percent about fresh fruits and vegetables. Even alcohol had more than half of people (56 percent) responding negatively, despite the growing number of alcohol delivery services. Josh Olson, an Edward Jones analyst covering the technology sector, said trust aside, getting more people on board with online grocery delivery could be challenging because of the preference for personally choosing items such as produce. “There’s still the in-person experience with food and perishables that isn’t the same when it comes to consumer electronics,” he said in a phone interview Monday. But Olson said it’s likely not part of Amazon’s play to completely replace in-store grocery shopping with online delivery — particularly given the brand’s own brick-and-mortar efforts — so compelling people to swap even one grocery trip per month with an online order would be a move in the right direction. Amazon’s pending purchase of Whole Foods is not necessarily a death knell for its competitors. Kalb noted that brands such as Instacart can compete in the online delivery space even with a company like Amazon, as long as they assert their added value — such as a more accurate delivery window. Polling was done among 2,177 adults between June 20-21. See full results here. Correction: A previous version of this story misstated the sum of Amazon’s deal with Whole Foods.